One of our Thanksgiving Crafts is the Indian Welcome Set. The yard signs are built in our workshop. The male Indian is hand painted brown, black, blue,and red. 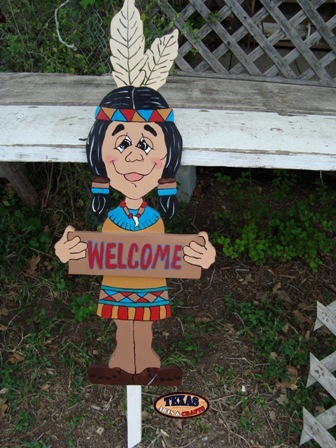 The Indian is holding a sign that reads Welcome. The female Indian is painted brown, yellow, blue, and black. 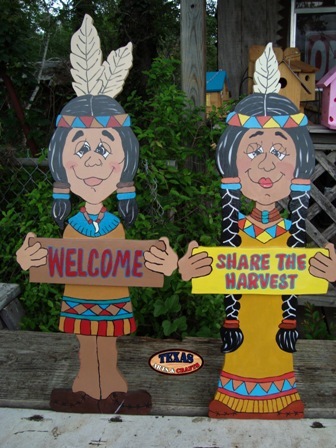 The Indian is holding a sign that reads Share the Harvest. The dimensions for the male Indian arts and crafts sign is approximately 32.50 inches tall by 13 inches wide by 1.50 inches deep. The sign has a 24 inch stake. The sign weighs approximately 3.25 pounds with packaging. The dimensions for the female Indian arts and crafts sign is approximately 30.50 inches tall by 12.50 inches wide by 1.50 inches deep. The sign has a 25 inch stake. The sign weighs approximately 3.50 pounds with packaging. The signs have a combined weight of 6.75 pounds. For the continental U.S. shipping and handling is included in the listed price. For shipping outside the continental U.S. please contact us through our Contact Us page. One of our Thanksgiving Crafts is the Indian Welcome Sign. The yard sign is built in our workshop. The Indian is hand painted brown, black, blue,and red. The Indian is holding a sign that reads Welcome. The dimensions for the arts and crafts sign are approximately 32.50 inches tall by 13 inches wide by 1.50 inches deep. The sign has a 24 inch stake. The sign weighs approximately 3.25 pounds with packaging. For the continental U.S. shipping and handling is included in the listed price. For shipping outside the continental U.S. please contact us through our Contact Us page. One of our Thanksgiving Crafts is the Indian Girl Sign. The yard sign is built in our workshop. The Indian is hand painted brown, yellow, blue, and black. 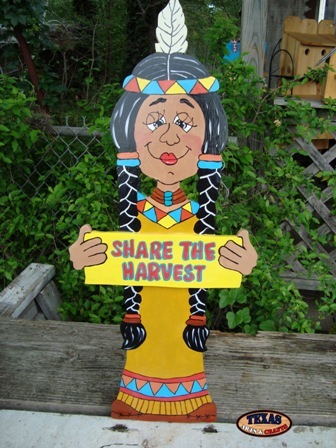 The Indian is holding a sign that reads Share the Harvest. The dimensions for the arts and crafts sign are approximately 30.50 inches tall by 12.50 inches wide by 1.50 inches deep. The sign has a 25 inch stake. The sign weighs approximately 3.50 pounds with packaging. For the continental U.S. shipping and handling is included in the listed price. For shipping outside the continental U.S. please contact us through our Contact Us page. 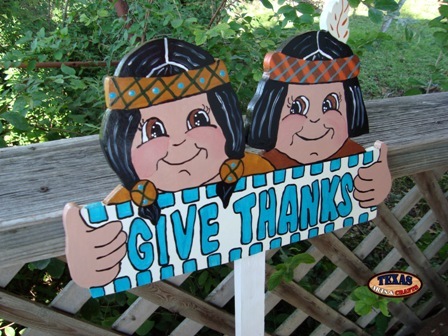 The Give Thanks Indians sign is built in our workshop. The girl Indian is hand painted brown shirt. She has a brown, blue, and green hair band. The boy Indian is hand painted in a brown shirt. He has a brown and blue hair band. He also has a red and white feather in his hair. 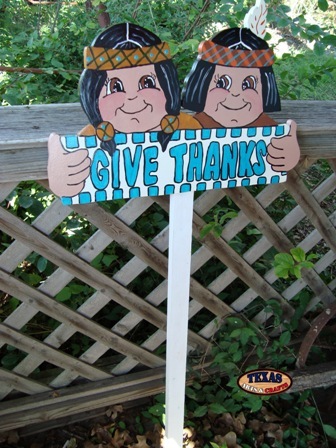 They are holding a sign that reads Give Thanks. The dimensions for the arts and crafts sign are approximately 13 inches tall by 18 inches wide by 1.50 inches deep. The arts and crafts yard sign has a 32 inch stake. The sign weighs approximately 4 pounds with packaging. For the continental U.S. shipping and handling is included in the listed price. For shipping outside the continental U.S. please contact us through our Contact Us page.